According to the U.N. refugee agency (UNHCR), as of this writing in 2019 there are 68.5 million people displaced by war and violent conflict. Our human minds and hearts are not equipped to comprehend suffering on this scale. We can, however, hear human voices one at a time, and we can empathize with images that tap into our personal comprehension of suffering. To help us understand, we are grateful for the story and photos provided by Lynsey Addario at National Geographic of the almost fathomless difficulties facing wives and children of fighters for the Islamic State and for the letters of frustration and hope by refugee children resettled in Europe, made available to us by UNICEF. Their words and struggles — illustrative of the much larger worldwide refugee crisis — move our hearts, and that movement is itself a prayer. We hear with unspeakable sorrow that of the 60,000 women and children fleeing the fighting between Syrian forces and remnants of the Islamic State who arrived at al-Hol refugee camp in northeastern Syria, "about 100, mostly children, have died either en route ... or shortly after arriving, due to acute malnutrition, pneumonia, hypothermia, and diarrhea, according to the International Rescue Committee." May we be instruments of mercy, and may the scale of this crisis not keep us from doing something each day — a prayer, a contribution, a raising of awareness — to help. We hear the desperation in Addario's description of Miriam, 29, from the Russian Caucasus; she has "three gaunt children with thinning hair — signs of severe malnutrition. Her youngest, one-year old Fatima watched carefully as her mother removed a piece of bread out of a plastic bag just distributed by aid agencies. Listless, Fatima was too malnourished to cry, scream, or to even reach for the bread." May we share from our bounty with aid agencies that support refugees. We hear 10-year-old Osama from Syria, now living in Germany, when he writes: "It hurts knowing that I left the place in which I grew up and I had so many memories in with my grandfather, grandmother, my relatives and my friends. In my home country, everything was simple but beautiful and warm." May we be well guided to help those torn from their homes. 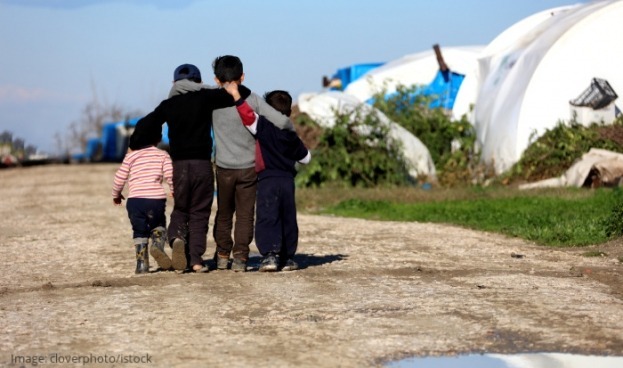 We hear 11-year-old Bayan from Syria, now living in Greece, when she writes: "In order to leave the country, we had to give up all our money and then borrow some more. It was very scary to come to Greece and we tried three times to make it. Now, I have been living in Skaramangas camp for seven months with my uncle and his family. My parents are in Germany and I haven’t seen them for more than a year. We are all safe now, but everyone is in a different country." May we help families reunite. May we encourage all who are using their suffering to make life better for others.